Garstang made it three consecutive wins with a 1-0 victory against St Helens Town at the Riverside. 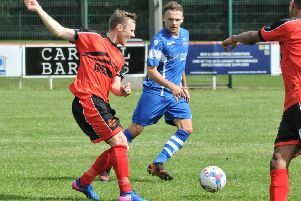 Riversiders’ manager Lee Baker again had to shuffle his squad with Shaun Sailor and Alan Coar absent but Phil Nagy, Jake Salisbury, Kieran O’Connor and Tom Entwisle were available. With a rock hard playing surface and a strong, freezing wind, the game was never going to be for the purists as both sides were defeated by the conditions and produced a dour game. Clear-cut chances in the opening half were few and far between but the better football was played by the Riversiders. Ric Coar saw a header go just wide after good work by Salisbury, while the visitors had a couple of efforts comfortably dealt with by Will Kitchen. As the half progressed, Garstang were starting to apply some pressure with Jack Swindlehurst’s 25-yard shot going just wide of the post. The deadlock was eventually broken when Ric Coar chased down a clearance and held the ball up with his back to goal under pressure from a St Helens defender and was then unceremoniously pulled down for a clear penalty. Entwisle stepped up and sent the keeper the wrong way as his penalty gave Garstang the lead and set a new league landmark as the 4,000th goal scored in the league this season. The second half saw the visitors look far more dangerous as Garstang seemed unable to take some of their good first-half play into the second. Kitchen made a number of superb saves to keep the home side in the game with one point-blank save the pick of the bunch. When Kitchen was eventually beaten, Westwood was on hand to make a great clearance off the line to keep the lead intact. Baker used his substitutes as O’Connor, Andrew Murphy and Jack Bennett all came on. Nagy and Billy McKenna linked up well down the left wing but the resulting cross was headed straight at the visitors’ keeper. Ric Coar had a great chance to extend the lead but headed Nagy’s corner just over the bar, which proved to be the final chance of the game as Garstang took victory.